In honor of the 100th anniversary of the sinking of the Titanic, we recently posted a dataset on the passengers aboard the ship that included Class (coach or first), Gender (female or male), Age, and Status (survived or died). From Age an additional column was created indicating Child (17 years or younger) or Adult (18 years or older). In an earlier post, we showed how survival rates could be compared between levels of one variable—for example, females versus males—using Stat > Tables > Cross Tabulation and Chi Square. But what if we wanted to take all factors into consideration to paint a complete picture of survival rates? 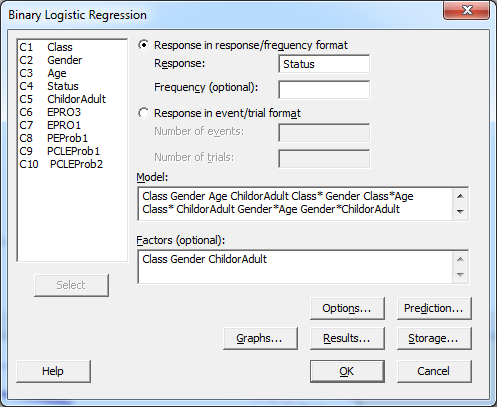 For these tests, a significant p-value indicates our model does not fit the data adequately. While we do have one significant test (Deviance), the other two tests provide no evidence of significance and we are fairly comfortable that our model provides a good fit. 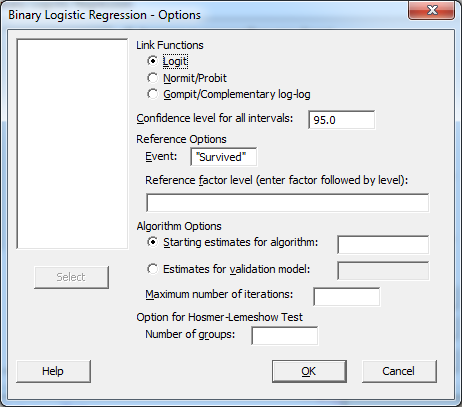 If you find you have significant terms but the Goodness-of-Fit Tests are showing an inadequate model fit, it may be worth trying a different Link Function back in the Option dialog. In this case, I found the Gompit link function to provide the best fit. Measures of Association compares how often passengers who survived had higher predicted odds of survival than passengers who did not survive. By comparing every surviving passenger with every passenger who died, Minitab determines how often the model correctly or incorrectly predicted which would survive. In our analysis, 74.2% of the time the surviving passenger had higher predicted odds of survival, while 24.7% of the time they had lower and 1.1% of the time the odds were the same. With a good model you want a high percentage of concordant pairs and a low percentage of discordant pairs. Interestingly, there was only one female child in the first-class cabin on that voyage, therefore we could not model the survival odds for female children in first-class. 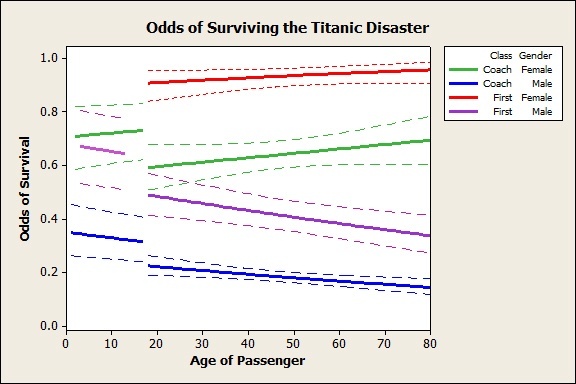 Otherwise, it is clear from the graph that if you were an adult female in first class, your odds of survival were quite high and increased slightly if you were older. Even for an 18-year old female in first class, the odds of survival are estimated at 90.6% as compared to 32.3% for passengers in general! Unlike females whose odds of survival increased with age, a male’s odds of survival decreased with age. 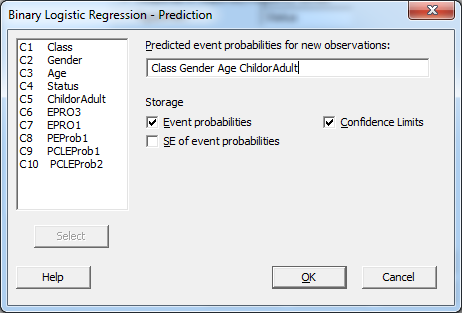 (Remember that Gender*Age interaction?) So for an 80-year-old male passenger in coach, your odds of survival were a mere 14.4%! See in the dataset that of the 25 passengers meeting this criteria, a mere 3 survived for a true rate of 12%, which is consistent with the model. Had you been a male passenger who knew ahead of time about the impending tragedy, the cost of a first class ticket would have felt like a bargain. The same 80-year-old male would have enjoyed a relatively good 33.7% chance of survival had he booked in first class. Likewise, taking this voyage as a 17-year-old who would have been boarded on a lifeboat instead of an 18-year-old who would remain on the sinking ship increases your odds of survival by 10-14%, depending on Gender and Class. By looking at multiple factors at once, we are able to get a clear and accurate look at the odds of survival for any passenger based on just a few factors!